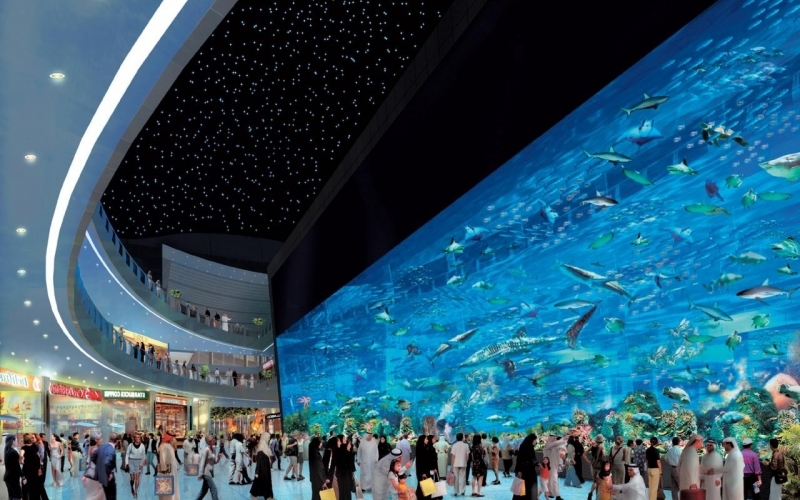 Located within The Dubai Mall, experience the largest aquarium window in the world. 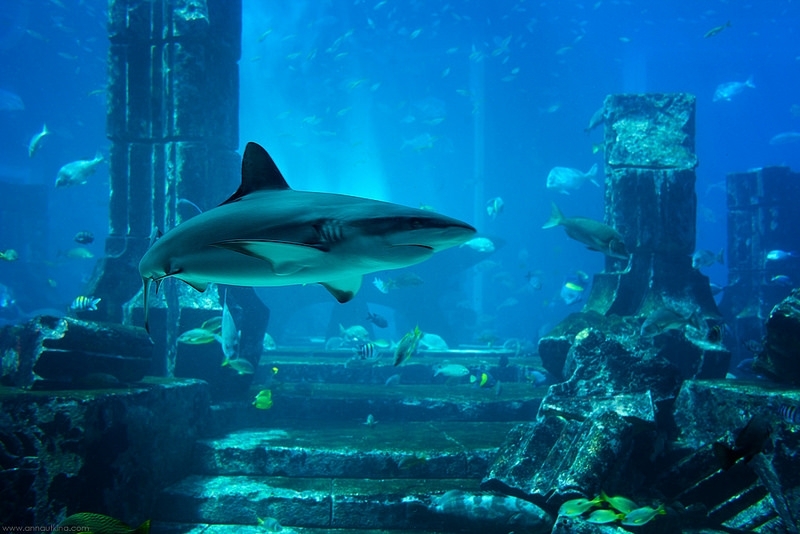 The 10-million liter Dubai Aquarium tank, which is the biggest aquarium in the world, allows you to get up close and personal with more than 33,000 aquatic creatures. The world's largest aquarium window brings you face-to-face with species of fish you have never seen before like enormous Sand Tiger Sharks, graceful Stingrays, giant Groupers and shimming shoals of pelagic fish. It all adds up to an underwater adventure that promises to be truly memorable. 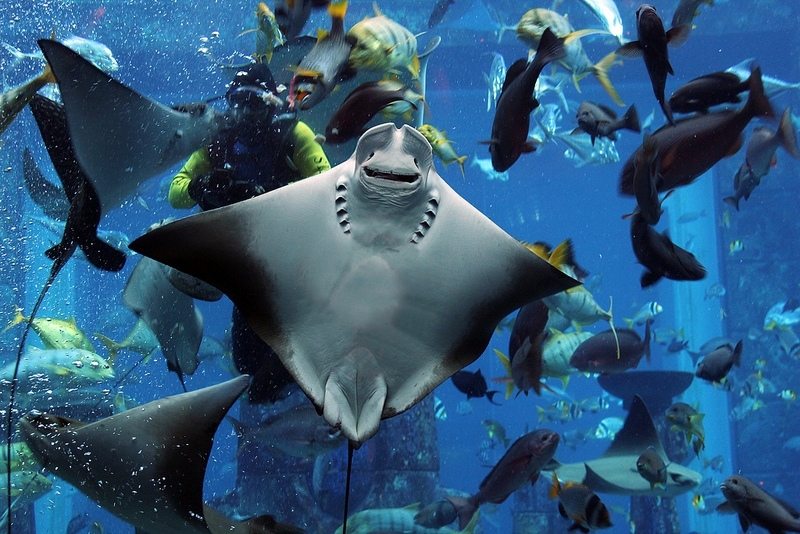 The aquarium houses over 140 species and includes around 400 sharks and rays. The most amazing highlights there are the Tiger Sharks collection that will leave you amazed. 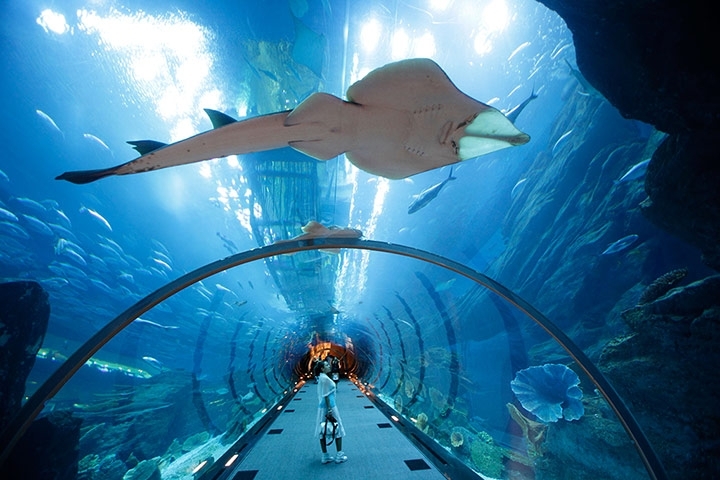 Walking through the 48-meter long tunnel will give you fantastic 270-degree views of the gigantic aquarium, and will make you have the time of your life. Also, you can always enjoy the underwater zoo that houses Sea otters, piranha, penguins and many other interesting animals to see. For an even more amazing experience, you can enjoy walking along the Rainforest, the rocky shore and Living ocean environments at the biggest Underwater Zoo. You will find yourself facing the dangerous Piranhas, Giant Catfish, playful Otters, a Humbolt Penguin colony and much more interesting inhabitants. Not to mention, the great experience you will have watching the spectacular 'lunar-cyclic' lighting system that changes the ambiance of the tank according to what suits the time of the day. You can enjoy and explore the aquarium with various passes like the Basic Pass, the Explorer Pass, and the VIP Line Buster. 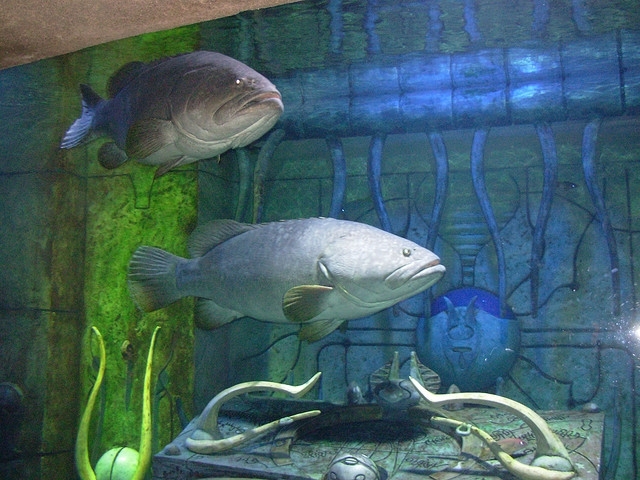 The Basic Pass: allows you to get an access to the Aquarium tunnel and the Underwater Zoo. The Explorer Pass: allows you to have a closer look at the sea creatures. It also allows you to get an access to the submersible simulator and the amazing big screen theater plus a free ride on the glass-bottomed boat. The VIP Line Buster: This pass will allow you to enjoy all the benefits of an Explorer pass, as well as fish feeding! You can also purchase a combo ticket while you are there. It grants you an access to the Underwater Zoo and the Aquarium Tunnel along with tickets to the observation deck on the 124th floor of the Burj Khalifa! You will have to have a Government Valid ID card to be presented for entry. All tickets can’t be canceled, amended or refunded. How to Get Dubai Visa?